The Nigerian Supreme Council for Islamic Affairs (NSCIA) declared the Federal Government was not taking seriously the current security challenges of Nigeria. 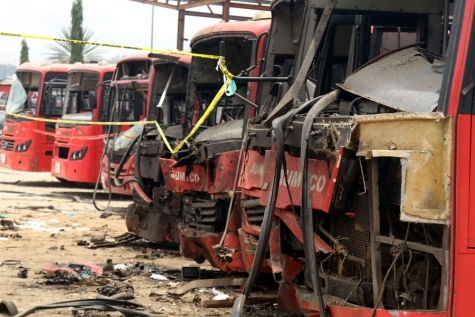 This has been contained in a statement signed by NSCIA Media Committee Chairman, Alhaji Femi Abbas, in reaction to Abuja bomb blast at Nyanya motor park on April 14, 2014. Nigeria’s Islam supreme body noted that although today’s precarious experience is not peculiar to Nigeria alone, others were very serious in tackling such situation. “We have a three-tier government to which the citizenry looks for protection and necessary provision of social amenities. Yet, the feeling of sense of security looks alien to an average Nigerian. “For how long will these lamentations and condemnations continue?,” the NSCIA asked. The group noted it was strange to apply 18th century solutions to solve 21st century’s problem, and expect that it would bear fruit. The recent events showed that the same strategy used in the past three years has become obsolete for the problem of the moment. A change of tactics is essential. “It is like treating the effect of an ailment while ignoring its cause. What Nigeria seems to have been doing in the past three years is like scratching a monster on the head,” NSCIA concluded. It would be noted that the state of emergency in Borno, Yobe and Adamawa states expires on April 19, 2014. Dumping the decision on its prolongation is seen by Northern leaders, stakeholders and groups exactly as the “new tactics”. Wow! See How Much Osita Iheme Pawpaw’s New Mansion Costs! Next articlePHOTOS: Actor Idris Elba Becomes A Father.